VBS/Vierika is a mass mailer (worm) written in Visual Basic Script. This worm consists of two different script parts, one that arrives in an Outlook message as an attachment and another that is available on a web site. On March 5th, 2001, F-Secure received several report about this worm. Due to efforts made by F-Secure Corporation and its Italian partner Symbolic S.p.A, the web page that contains the main part of the worm has been disabled in a few hours. On that way spreading of the worm has been stopped. The attachment contains a small script, that lowers Internet Explorer security zone settings and also changes the start page to an Italian site. This page contains a script code, which is the main part of the worm. Next time when Internet Explorer is started, the browser will connect to the infected page. Since security zone settings are lowered by the first part of the worm ("Vierika.JPG.vbs"), the second part ("Vindex.html") is able to execute directly from the web site. 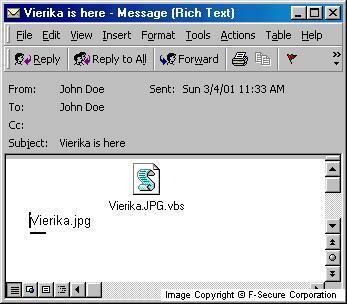 This part will first drop a file "c:\Vierika.JPG.vbs" that is the first part of the worm, and spread it using Microsoft Outlook to to each recipient in every address book. Also the Internet security zone setting should be restored from "Tools/Internet Options/Security" dialog at least to "Medium" level. F-Secure Anti-Virus has a heuristic that detects this worm. This detection is included in updates released before March 5th, 2001.